Since the 1980s, the Vitra company has erected buildings in collaboration with world-renowned architects. This unique architectural ensemble includes structures by Tadao Ando, Frank Gehry, Nicholas Grimshaw, Zaha Hadid, Herzog & de Meuron, SANAA, Álvaro Siza and others. 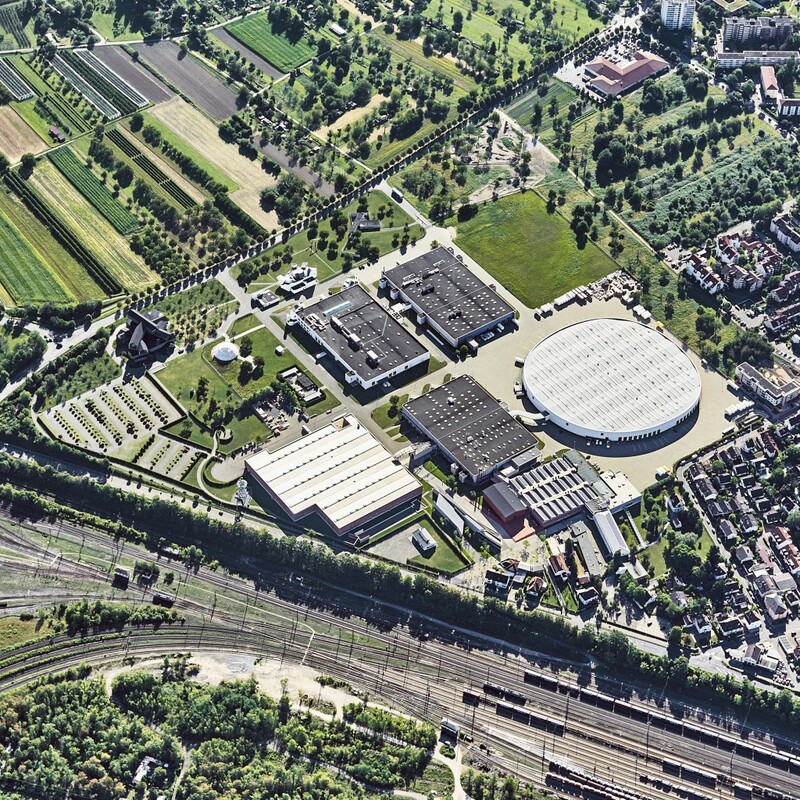 In reference to the Vitra Campus, the architectural critic Philip Johnson wrote: »Since the Weissenhofsiedlung in Stuttgart in 1927, there has not been a gathering in a single place of a group of buildings designed by the most distinguished architects in the Western world.« The individual buildings contrast with one other, yet at the same time they blend in with their surroundings. They reflect a corporate philosophy that does not strive for a uniform image, but presents a variety of positions within the context of an open project. The VitraHaus – Vitra’s flagship store – provides a venue for the presentation of the entire Vitra Home Collection, ranging from the great classics to the newest pieces by current designers. The displayed furnishings and objects can be tested, ordered and purchased on site. Please note that visitors can experience many of the buildings exclusively as part of the Architecture Tour. 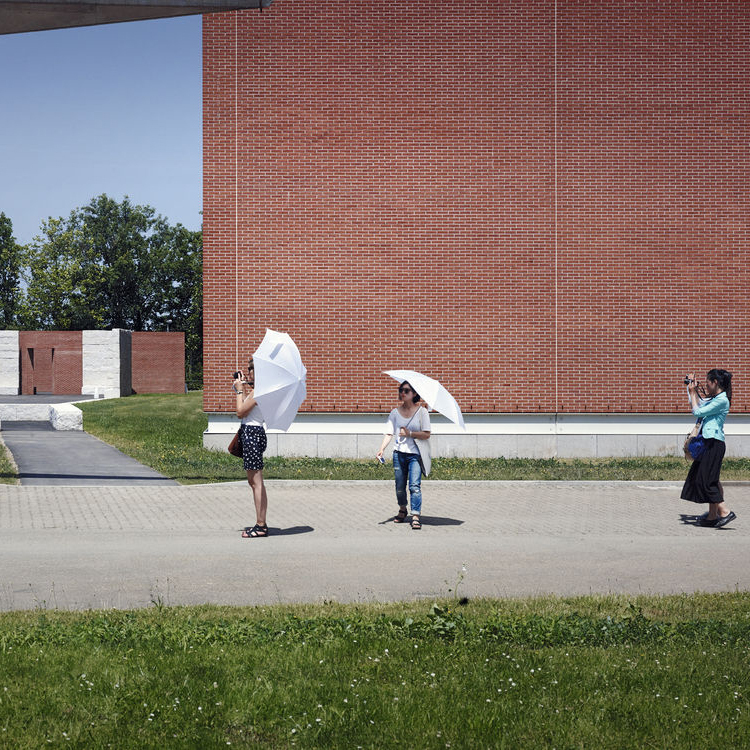 The Vitra Campus comprises a public and a private area. In the public space, you will find the Vitra Design Museum, the VitraHaus and the Vitra Silde Tower on the Álvaro-Siza-Promenade as well as the Vitra Schaudepot. The private area, where the production facilities are located, can only be accessed as part of an architectural tour. 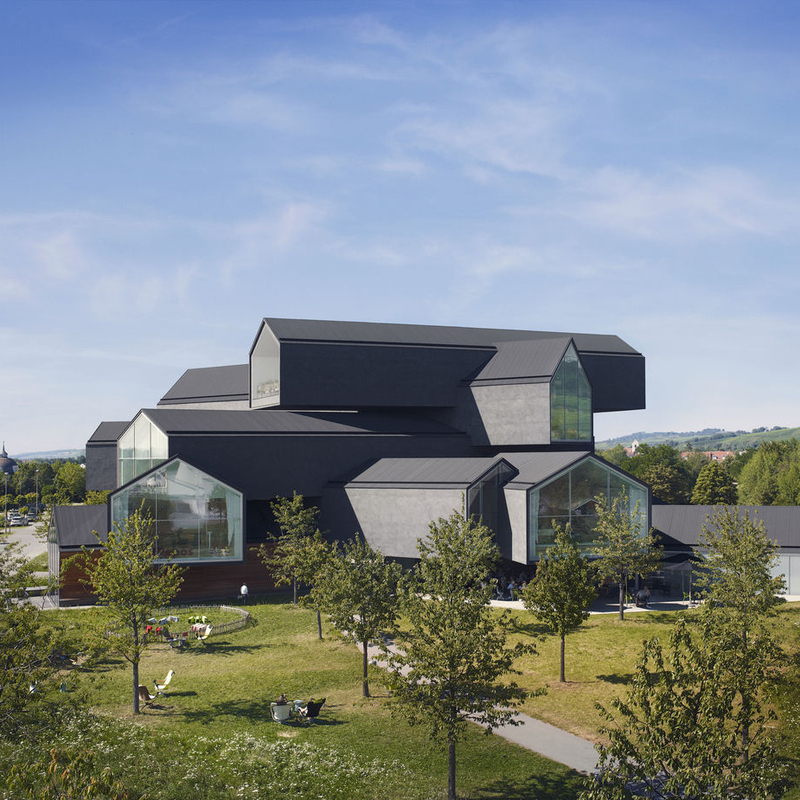 The Vitra Design Museum building was designed by the American architect Frank Gehry as his first project in Europe. 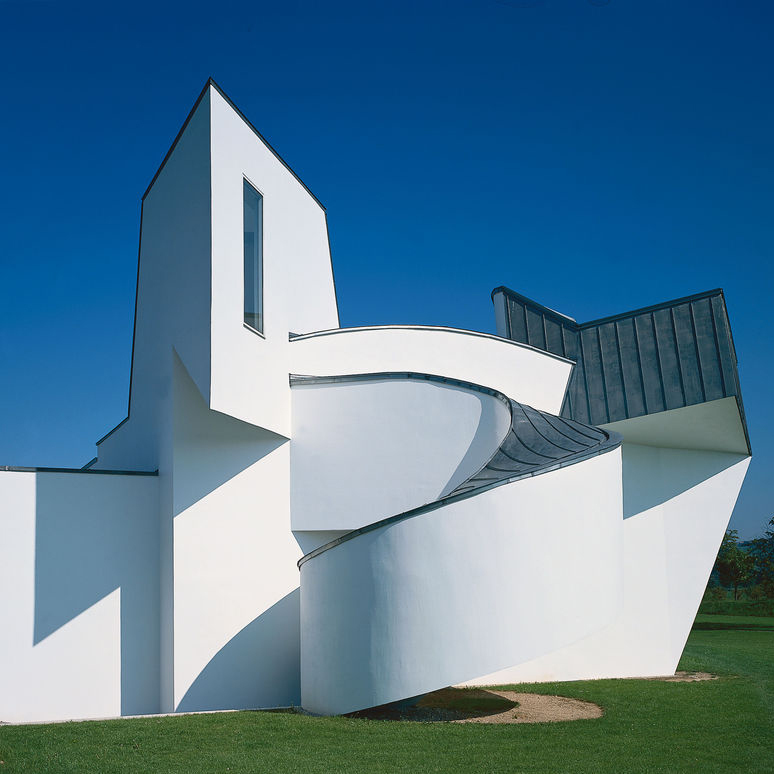 While Gehry’s earlier buildings were still associated with the image-oriented language of Postmodernism, the architect limited himself with Vitra Design Museum to a white plaster facade, zinc roof and a cubic volume comprised of simple geometric forms. Out of these almost classical-seeming elements, he created a dynamic sculpture in which the individual structures appear to break up into fragments and begin to move. The aesthetic of the Vitra Design Museum was instrumental in the emergence of the stylistic concept of “Deconstructivism” and marked a new phase in Gehry’s oeuvre that he continued to develop in major projects over the following years (such as the Guggenheim Museum Bilbao, 1996).In the interior, the Vitra Design Museum has four large exhibition galleries with uniform white walls and approximately 700 square metres of exhibition space. The main source of light is a central window in the roof whose cruciform shape is visible from the outside as the focal point of the building’s composition. Also prominent on the exterior are the diagonal structures housing the stairways. The expressive exterior forms of the building are thus very much determined by their function and reflect the requirements of a complex museum building. With the Vitra Design Museum, Gehry succeeded in combining two fundamentally different types of museum architecture. On one hand, the building is a surprising reinterpretation of the “white cube”, offering an unadorned context for the presentation of exhibits. From the outside, however, it is conceived as a pictographic architectural sculpture that helped the Vitra Design Museum gain international renown. 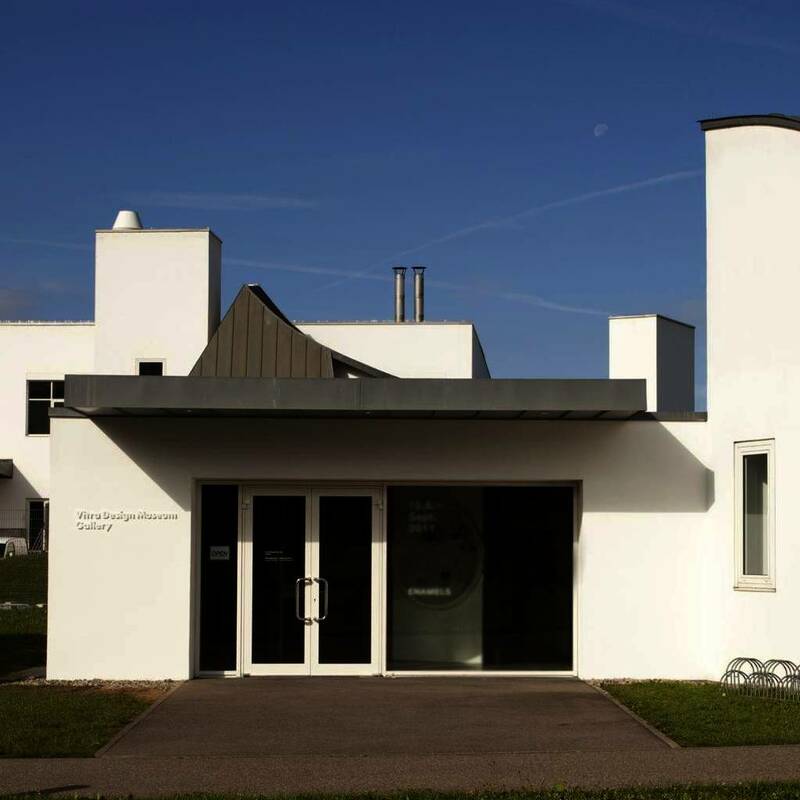 Along with the Vitra Design Museum, Frank Gehry created a gatehouse in 1989 with adjoining office space located at the entrance to the Vitra Campus. In 2003, this complex was expanded to the rear with an addition near the entrance of the Vitra Design Museum. 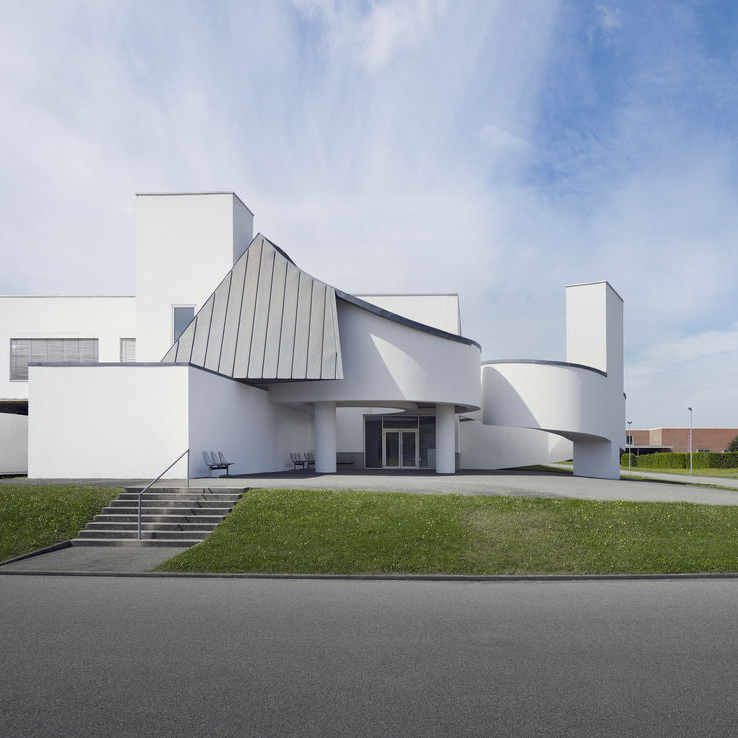 It houses the Vitra Design Museum Gallery in which current, often experimental exhibitions are shown that complement the main exhibitions in the museum. Parallel to his work on the Vitra Design Museum, Frank Gehry produced a large factory hall in 1989, which is located directly behind the museum on the Vitra Campus. The reduced basic form of this building corresponds to its function as an assembly hall. The two entrances to the front area containing a cafeteria and offices, however, feature Gehry’s typical sculptural structural forms and establish a visual link to the museum building. 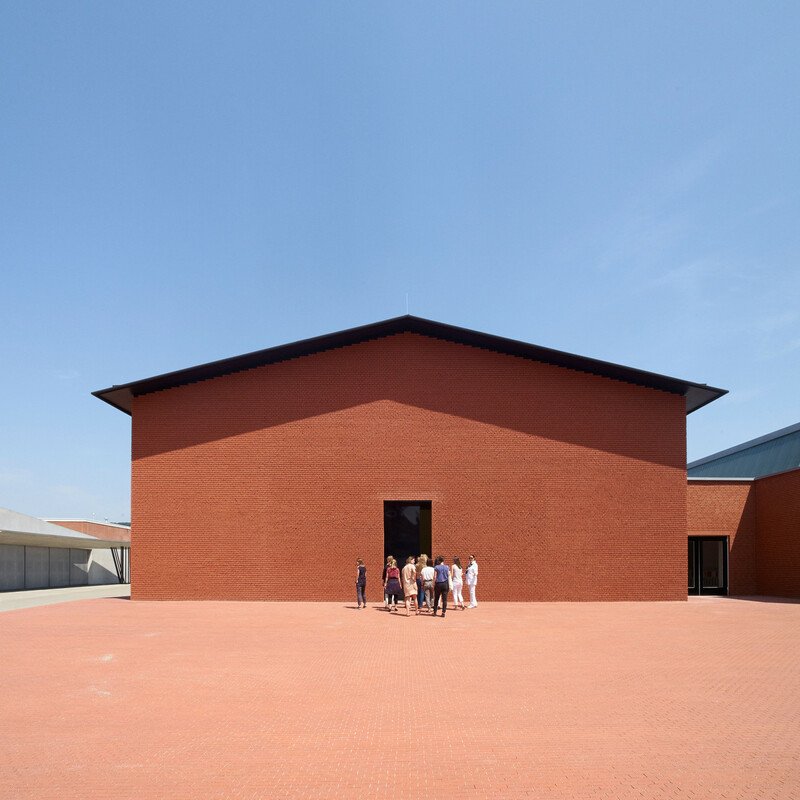 Reminiscent of anonymous nineteenth-century factory architecture, the large simple brick structure by Álvaro Siza concedes to the needs of the other buildings on the grounds. The most striking element of the building is the arched bridge-like roof construction connecting the hall with the adjacent building by Nicholas Grimshaw. Its raised position maintains unobstructed views of Zaha Hadid’s Fire Station from the entrance of the Vitra Campus. When it rains, the bridge automatically descends to provide a sheltered passage to the Grimshaw building. In 1981, a fire destroyed the majority of the conventional production facilities used by Vitra up to that point. The resulting reconstruction provided an opportunity to produce various buildings with renowned architects, which accumulated over time to form the current Vitra Campus. In the immediate aftermath of the fire, Nicholas Grimshaw was chosen in 1981 as the first architect to create a building on the Campus. As the insurance funds only covered a six-month interruption in production, Grimshaw designed a factory constructed from simple prefabricated metal elements. 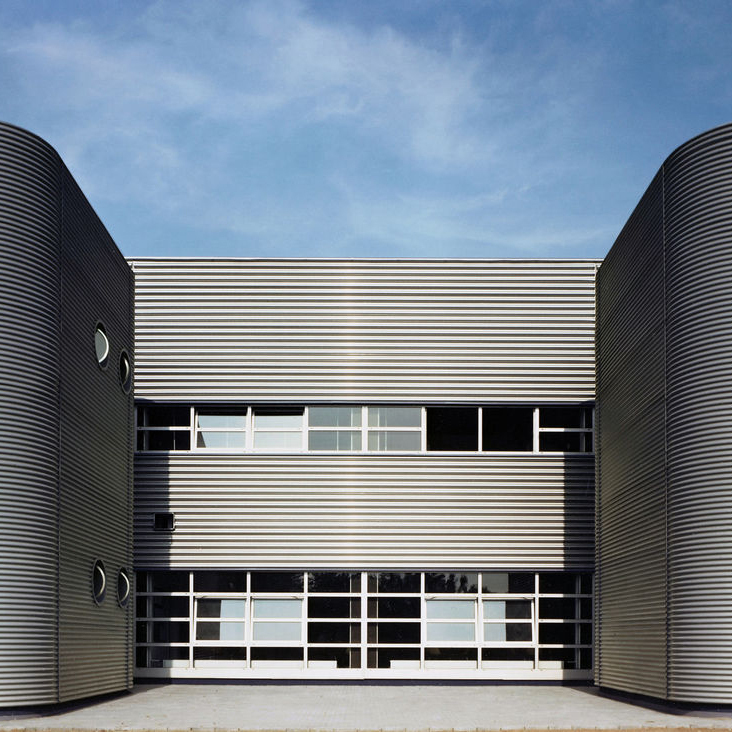 The horizontally striated façade made of corrugated sheet metal bears witness to the industrial purpose of the building as well as the technological competence of the company. In 1983, Grimshaw created a second factory hall that is nearly identical to the first. Both buildings are still used for production today. The first building additionally houses the Citizen Office, an innovative open-plan office conceived in 2010 by the interior designer Sevil Peach. After a major fire destroyed much of the premises in 1981 and made it necessary to reconstruct the factory compound, Vitra resolved to build its own fire station. The design of the Fire Station was assigned to the London-based Iraqi architect Zaha Hadid. She created a building housing a garage for fire engines along with another wing containing locker rooms, showers and common areas. The sharp-angled sculptural forms of the Fire Station were cast in situ using a complex shell construction method and contrast with the orthogonal order of the adjacent factory buildings. 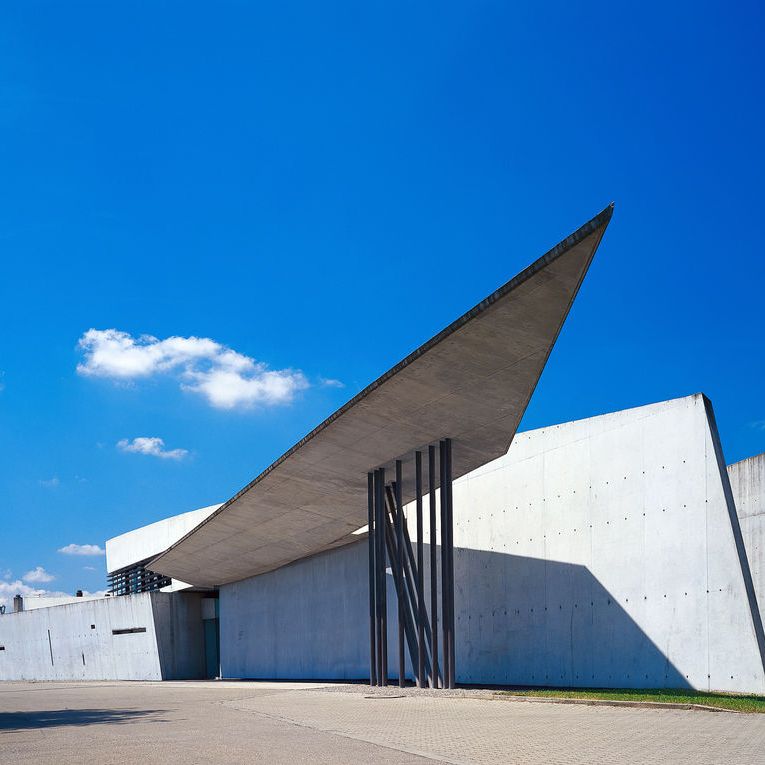 The Vitra Fire Station was the first full-scale work by Zaha Hadid ever to be realised and is regarded today – along with Frank Gehry’s building for the Vitra Design Museum – as a key work of so-called Deconstructivism and of late twentieth-century architecture in general. Today the building is used for exhibitions and special events. The Conference Pavilion by Tadao Ando was the architect’s first work outside Japan. The centrepiece of the building consists of a sunken courtyard that seems to conceal the surrounding environment and lends the building an almost monastic tranquillity and intimacy. From here, a series of narrow, carefully proportioned corridors and ramps lead to an assortment of conference rooms. The meticulously finished exposed concrete and wood surfaces reinforce the atmosphere of calm and concentration exuded by the building. They attest to the inspiration Ando takes from such architects as Le Corbusier and Louis Kahn while simultaneously evincing his roots in traditional Japanese architecture. 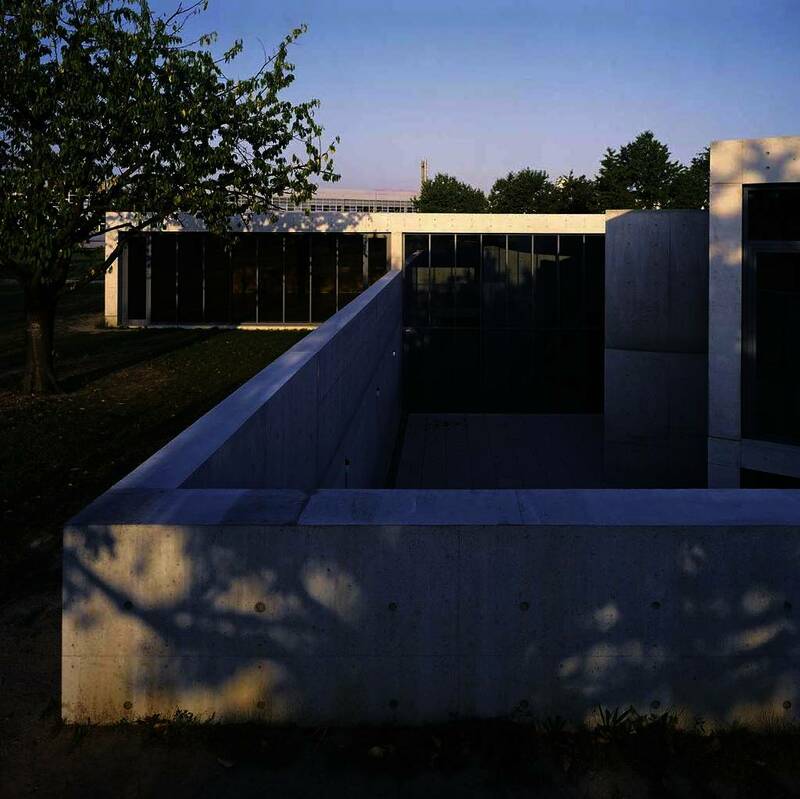 The synthesis of western and eastern architectural traditions that Tadao strives for in his buildings is also manifested in the distribution of light and the embedding of the building in the surrounding landscape, which recalls the austerity of Japanese Zen gardens. The visionary Richard Buckminster Fuller ranks as one of the great experimental architects of the twentieth century. His most important works include the Wichita House (1944), the Biosphere at the 1967 World’s Fair in Montreal as well as the futuristic automobile Dymaxion Car (1933). A central focus of Fuller’s activities was the investigation of so-called geodesic structures, which he utilised to create self-supporting dome buildings. To administer the licensing of his patents for these structures, Buckminster Fuller founded Synergetics Inc. in 1955 but later sold his shares in the company. The engineer Thomas C. Howard, a friend and associate of Fuller’s, subsequently continued to develop the easy-to-assemble dome buildings for Synergetics. These models were industrially produced and marketed by the company Charter Industries – as was the case with the dome currently located on the Vitra Campus. It was manufactured in 1975 and originally erected in Detroit/USA. 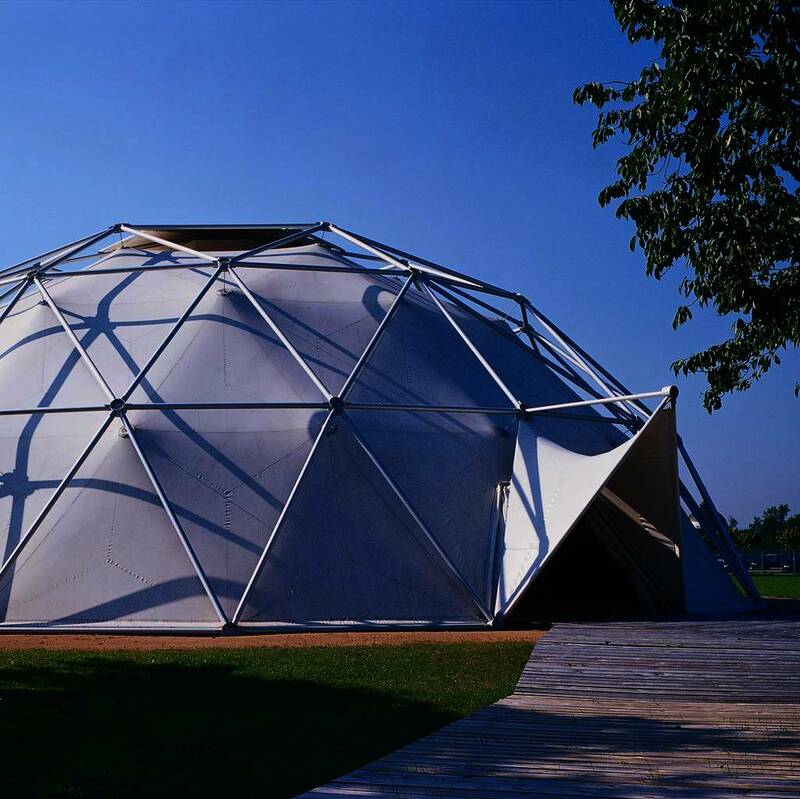 In 2000, the building was installed on the Vitra Campus where it serves as a space for events. Jean Prouvé was an important engineer, architect and designer of the post-war era. He developed furniture and buildings based on carefully constructed metal structures produced in his own metalworking shop. 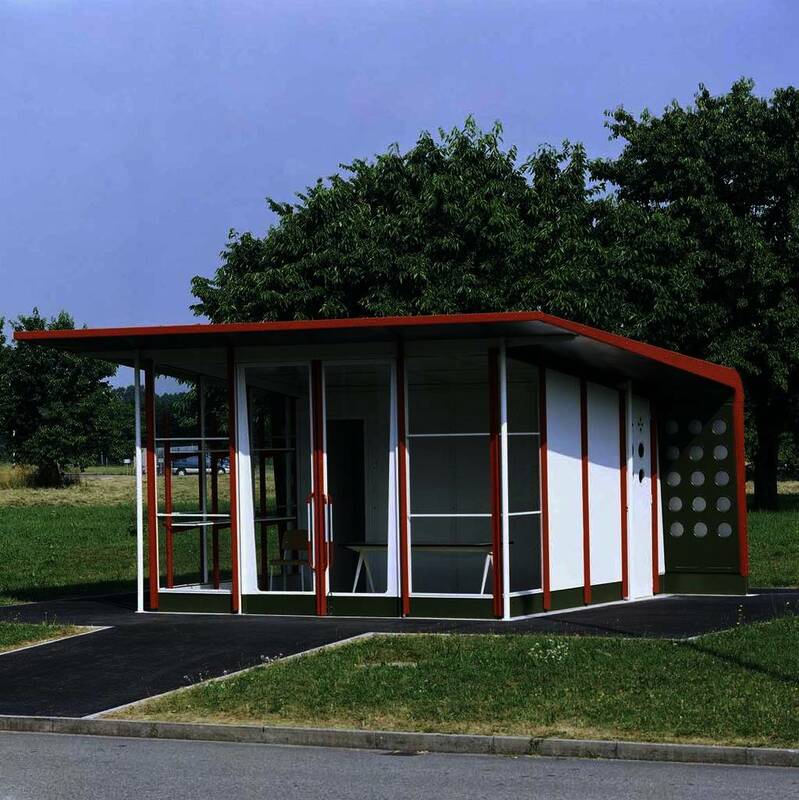 The small petrol station now located on the Vitra Campus was developed by Prouvé together with his brother Henri Prouvé around 1953 for the company Mobiloil Socony-Vacuum. It was originally situated at the “Relais des Sangliers” service area in the department of Haute-Loire in France. As one of three surviving examples of this type, it was reconstructed on the Vitra Campus in 2003. The building consists of angular aluminium components and sheeting perforated with bull’s eye cut-outs. The load-bearing structure and wall construction are clearly differentiated from one another, a distinction reinforced by the colour scheme. The building typifies the design principles underlying Prouvé’s other buildings and furniture pieces with which he anticipated many aspects of today’s high-tech architecture. The artist Claes Oldenburg and his wife Coosje van Bruggen number among the leading proponents of Pop Art. Since the 1960s, they have experimented with sculptures of everyday objects enlarged to monumental proportions. 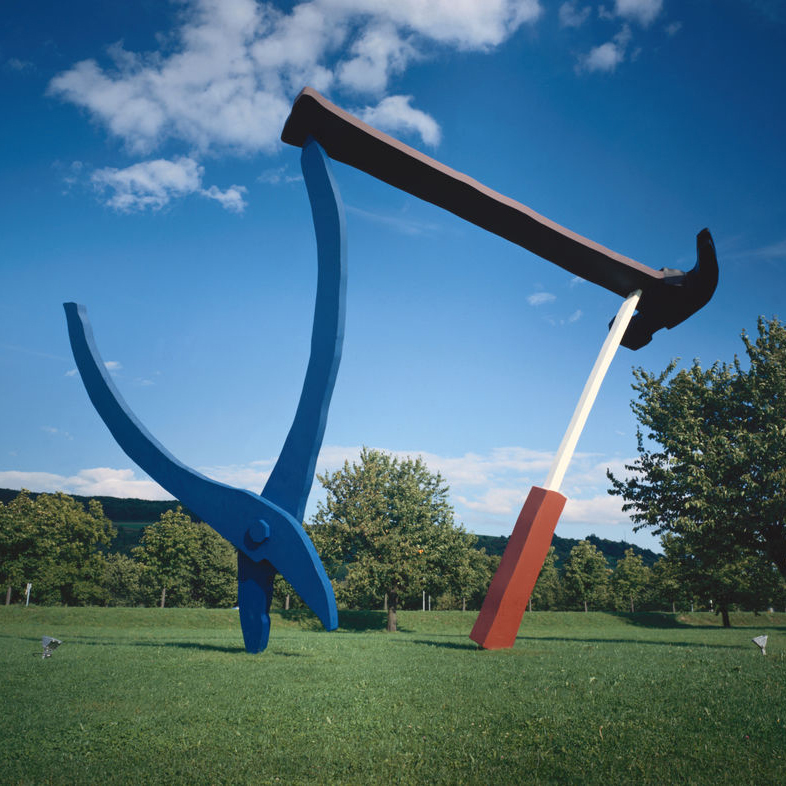 The sculpture Balancing Tools was commissioned by the children of Vitra company founder Willi Fehlbaum as a gift for his seventieth birthday. With a hammer, pair pliers and a screwdriver, it depicts the three main tools employed by upholsters who play a central role in the production of furniture. The enlargement of seemingly banal everyday objects, presented in simple primary colours, elevates these objects into memorable icons while reflecting the dialogue of art and technology that lies at the heart of the design process. With the construction of the VitraHaus in 2010, a space was created on the production premises which allows the wide range of Vitra products to be experienced under a single roof. The VitraHaus is Vitra’s flagship store: Here, visitors are offered inspirational ideas for their own homes and invited to explore their own taste in design. In addition to the product arrangements and consulting rooms on the upper levels, the ground floor of VitraHaus comprises the Vitra Design Museum Shop, the VitraHaus Café and a reception area where guests are welcomed to the Vitra Campus. The building was designed by Herzog & de Meuron, one of today’s most renowned architectural firms. The basic structure of VitraHaus consists of twelve elongated gabled houses, which are stacked at intersecting angles to form a five-storey structure. The gabled roofs yield an array of familiar spatial situations in the interior – the architects prefer to use the expression “domestic scale”. At the same time, the gabled forms cite the local architecture of surrounding communities and seem to pictorially frame the various residential worlds. In touring the various spaces, the building offers an ever-changing variety of moods and views – from the interior of the space as well as into the surrounding landscape, with the idyllic vineyards in the east and the industrial zones of Basel to the west. With its multi-layered concept, the VitraHaus is like an architectural expression of the pluralistic corporate culture that defines Vitra in all it does. 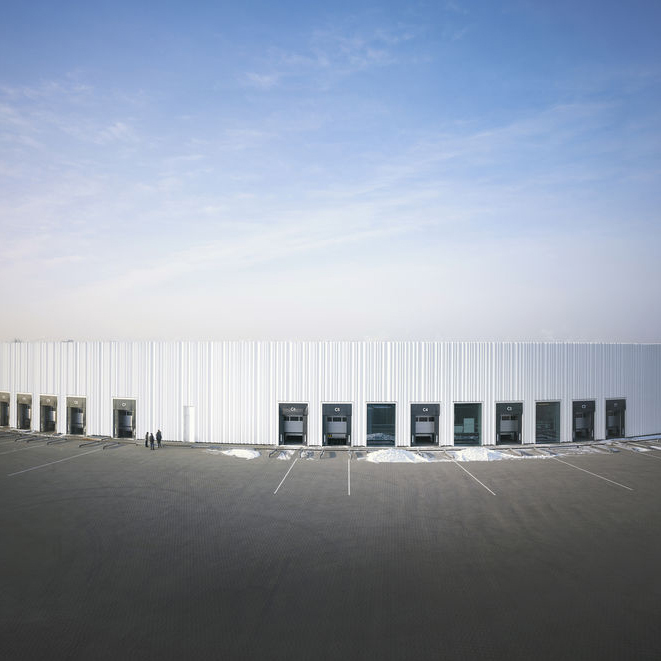 Designed by the Japanese architectural office SANAA, the Vitrashop Factory Building was completed in 2012. 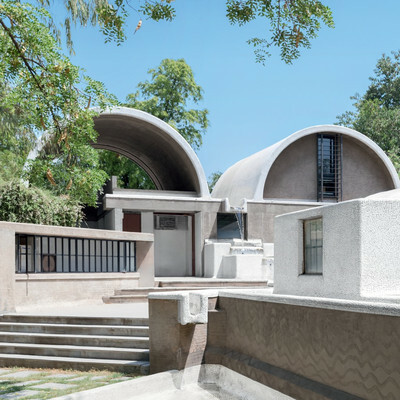 The building has a freely drawn, nearly circular footprint and consists of two adjoining semi-circular concrete shells. This roughly oval shape optimizes logistical operations by providing adequate space for the circulation of lorries. One half of the building has a basement storey with an underground garage that holds 240 parking spaces for employees. To avoid dependence on artificial illumination, rooflights were installed in the ceiling of the hall, thereby supplying the interior with abundant daylight. The flowing character of the building’s exterior is created by a white curtain façade made of undulating acrylic panels. Although the production hall is larger than any of the other factory buildings on the Vitra Campus, the façade gives it a light, almost floating appearance. Like other works by SANAA that have been realized in Europe – such as the Rolex Learning Center at EPFL, Lausanne, or the new building for the Louvre Museum in Lens – emptiness and lightness are central themes of the Vitra building. This impression is underscored by the seeming immateriality of the façade and the nearly surgical precision of the few openings in the building’s exterior. The so-called Álvaro-Siza-Promenade occupies a length of 500 metres. It consists of an asphalt pathway bounded by two-metre-high hornbeam hedges. In some parts, the hedges flank the path in a linear arrangement while other sections widen and open up to create green spaces. Siza chose hedges to illustrate the changing of the seasons. These are paired with hard, unchanging materials, as can be found in the earlier factory building by Siza: Dutch brick and Portuguese granite. The repertoire of forms and materials is reduced to a small number of elements. The pathway is syncopated with ‘episodes’ – distinctive sequential settings that offer a variety of unique spatial experiences. In the first phase of development, these include an S-shaped common area framed by hedges, the Vitra Slide Tower by Carsten Höller and an archaic-looking double chamber formed from interpenetrating brick and granite walls. The promenade is like a pilgrimage route marked by multiple stations, simultaneously evoking English gardens with its various ‘follies’. With the individual architecturally expressed elements, Siza counters the Romantic idea of an indistinguishable melding of nature and architecture – landscape and geometry follow their own laws but, as is typical of Siza’s work, find their way to a state of balance on a higher level. 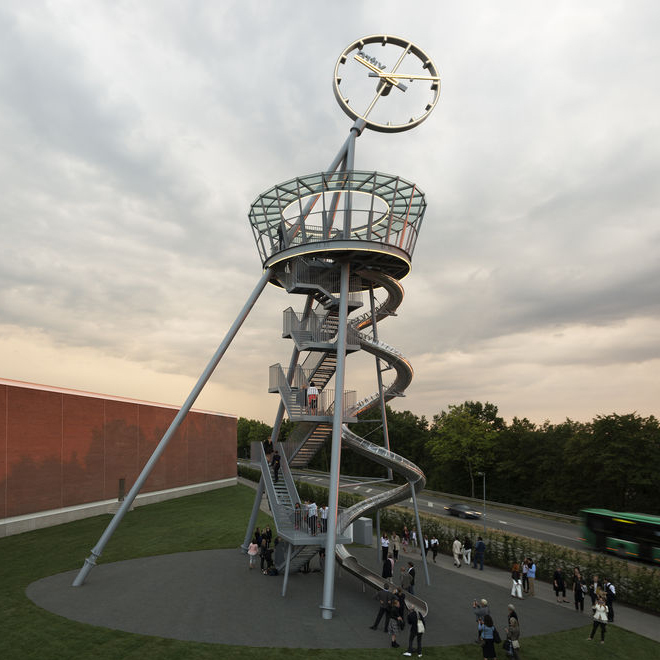 The 30.7-metre-high Vitra Slide Tower by the German artist Carsten Höller is a viewing tower, slide and art installation in one. It consists of three diagonal columns that meet at the top, with a revolving clock mounted at their point of intersection measuring six metres in diameter. The construction is vertically accessed via a double-flight staircase fitted into the slanted columns with intermediate landings. A viewing platform at a height of 17 metres offers new perspectives of the Vitra Campus and the surrounding landscape. The platform is the starting point for the 38-metre-long corkscrew tube slide. Following the VitraHaus (2010), the Schaudepot is the second building by Herzog & de Meuron on the Vitra Campus. The new structure combines the simple appearance of an industrial building or warehouse with the complex requirements of a walk-in museum repository. To the outside, the Schaudepot presents itself as a monolithic volume constructed from hand-broken bricks, characterized by a completely windowless façade and a simple gable roof. The bricks were split on site and give the building a lively texture. 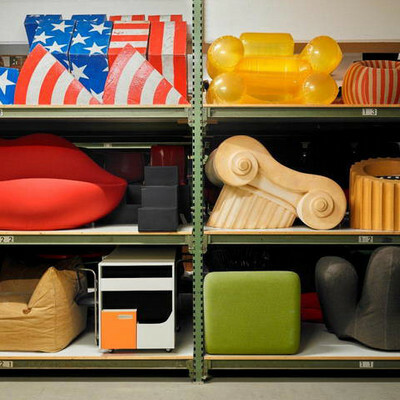 With its simple and dignified appearance, the Schaudepot reflects the cultural worth of the objects stored within. 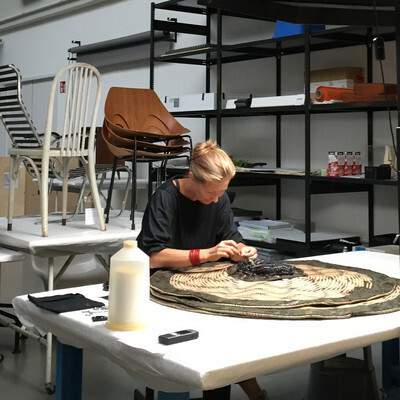 The interior of the building offers ideal conservational conditions for the preservation of the valuable pieces in the collection. The main hall on the ground floor of the building is defined by a regular gridded arrangement of fluorescent tubes on the ceiling, which evenly illuminate the interior. This space houses the permanent exhibition as well as temporary exhibitions related to the collection, along with the entrance area and a shop. 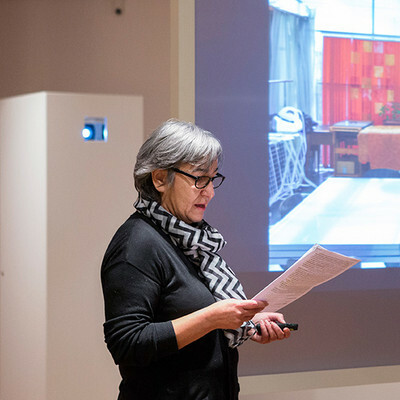 A third section contains wardrobes, sanitary facilities and a café, and links the building to the restoration workshop, the library and the offices of the Vitra Design Museum. A large window connects the main hall to the lower ground floor, from which visitors can get a glimpse of the other repositories of the collection. This visual contact emphasizes the underlying concept of the building: it enables the museum's collection to outwardly grow and expand and gain a greater public presence with an above-ground display space. The existing repositories on the lower ground level will remain in operation, being further expanded and likewise becoming part of the overall presentation. The Schaudepot is fronted by a raised, public forecourt that ties the building into the architectural ensemble on the Vitra Campus. The building contrasts appealingly with the dynamic contours of the opposite Fire Station by Zaha Hadid (1993) while corresponding to the factory buildings by Álvaro Siza (1994), which were also executed in brick. 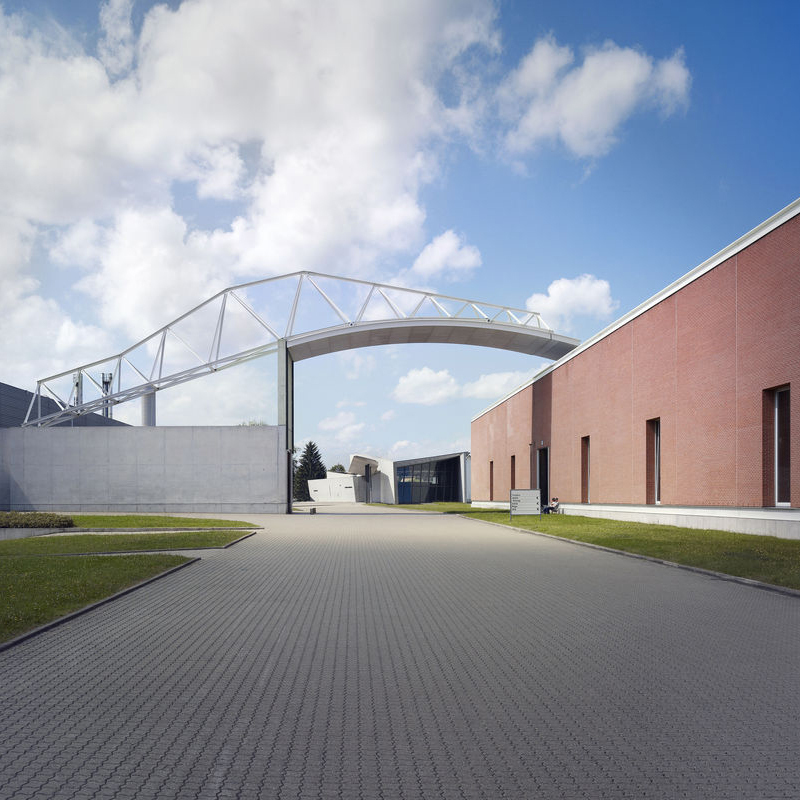 The Schaudepot extends the Vitra Campus towards the south and provides a second entrance to the public area, which also includes the Fire station. 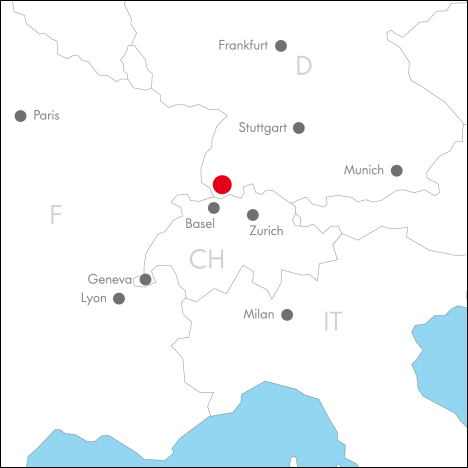 The city centre in Weil am Rhein, as well as the tram station to Basel city are both within walking distance. The Álvaro Siza promenade connects the Schaudepot with the northern entrance to the Campus, where the VitraHaus and the museum building by Frank Gehry are located. Along the path, the Slide Tower by German artist Carsten Höller leads the way and offers an elevated view of the entire architectural scenario on the Campus, which includes constructions and artworks by SANAA, Tadao Ando, Álvaro Siza, Nicholas Grimshaw, Renzo Piano, Richard Buckminster Fuller, Claes Oldenburg, and Jean Prouvé. 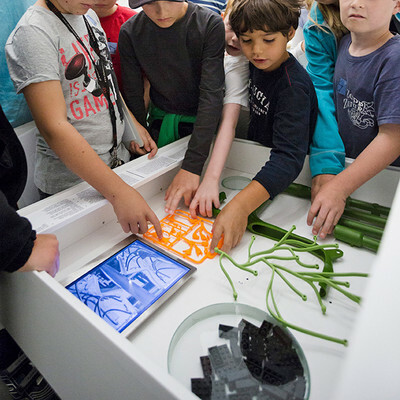 All exhibition spaces from the Vitra Design Museum are open daily from 10 am to 6 pm and the different exhibitions are complemented by a diverse programme, consisting of guided tours, discussions, workshops and other events.